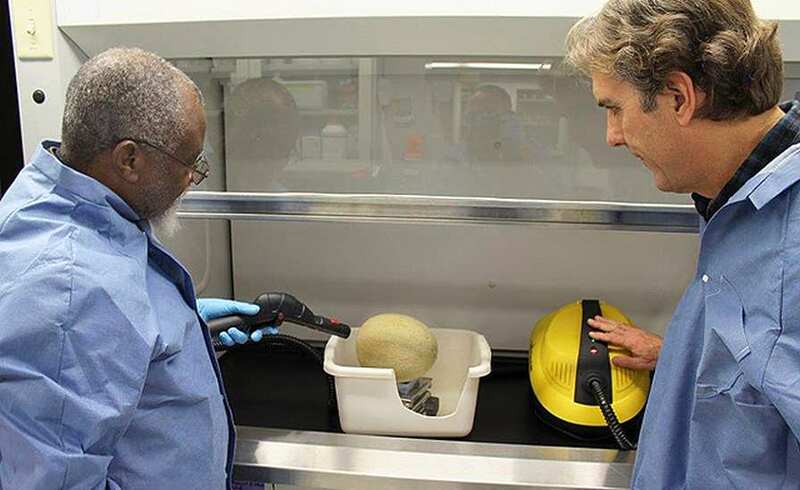 ARS food technologist Dike Ukuku (left) and chemical engineer David Geveke steam-clean a cantaloupe to reduce surface pathogen levels. Photo by Lee Chau. 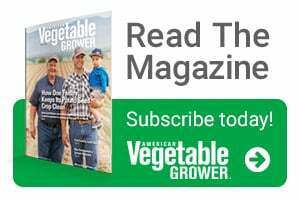 Steam can more effectively combat E. coli, Salmonella, and Listeria on cantaloupes than traditional removal methods, according to findings from an Agricultural Research Service (ARS) scientist in Pennsylvania. Dike Ukuku and his colleagues at the ARS Food Safety and Intervention Technologies Unit in Wyndmoor have demonstrated that a relatively inexpensive steam cleaner designed to remove wallpaper and clean outdoor grills can rid cantaloupes of E. coli, Salmonella, and Listeria more effectively than existing washes and chlorine treatments. The ARS study involved submerging cantaloupes in a bath inoculated with E. coli, Salmonella, and Listeria strains. After drying and refrigeration, the cantaloupes were cleaned with a commercially available power steamer. The technique produced sufficient heat to kill surface pathogens but not enough heat to damage the fruits. Pathogen levels on the surfaces of the steam-treated melons were generally 1,000 times lower than those on untreated melons. Pathogens on cut-up pieces of the cantaloupes were reduced beyond detection. Pathogen levels on steam-treated cantaloupes were about 100 times lower than those found on cantaloupes sanitized with chlorine. Processors and distributors could apply steam when cantaloupes are put into washers or as they are moved on conveyor belts during processing, Ukuku says. The technique also may effectively sanitize watermelons, honeydews, cucumbers, and baby carrots. The new technology has the potential reduce the number of foodborne disease outbreaks from contaminated produce, which annually cause nearly one million illnesses and more than 100 deaths. Read more about this research in the March 2017 issue of AgResearch magazine.